Planet X, aka Planet Nine, is there and astronomers are close to locating it according to new mathematical models which have narrowed down the search field for the most searched for planet in the outer rim of our solar system. Just last month, Us astronomers made headlines saying they had found a giant planet lurking the outer areas of our solar system. 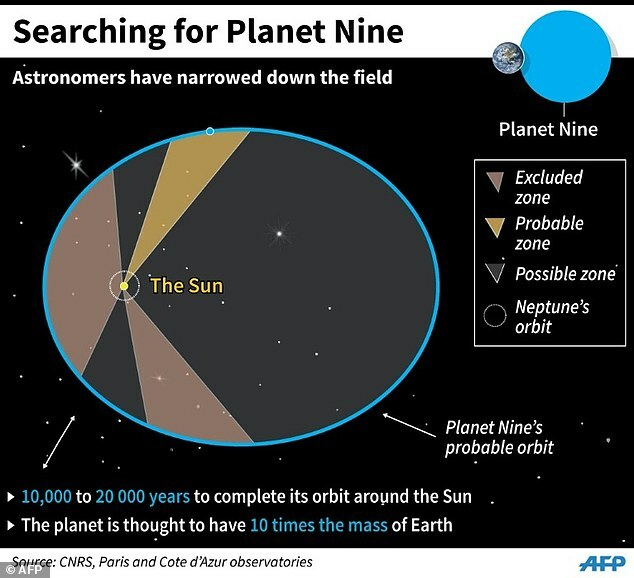 Now, a group of astronomers from Europe believe they have drastically narrowed down the search area for planet nine. By studying data provided by NASA’s Cassini spacecraft in orbit around Saturn, a French science quartet was able to exclude two zones in search for planet Nine, wrote the team in the journal Astronomy and Astrophysics. Their work has been received as a confirmation, suggesting that the planet which many believe is just a myth does, in fact, exist in the far reaches of our solar system. Based on mathematical models, the group of French researchers was able to calculate what influence such planet – travelling along the orbit postulated by Americans astronomers – would have in the orbit of other planets as it passed by them. The enigmatic Planet (X) orbits our sun at such a distance that it needs between 10,000 – 20,000 years to complete a single orbit around it. According to news reports, the enigmatic ‘rogue’ planet orbits the sun in a lopsided, extremely elongated orbit. Jacques Laskar of the Paris Observatory told AFP, they believe to have reduced the search are for Planet X by 50 percent, eliminating zones which they say, modeling does not match reality. ‘We have cut the work in half,’ he told AFP. According to Laskar and his team, the field of search for Planet Nine can be further reduced if the Cassini spacecraft, due to finish its mission next year, is extended to 2020. The discovery of Planet Nine is a long process, one that could take several years to complete say, scientists. Planet X, the Ninth Planet or referred to as Nibiru by some, has been the planet everyone has wanted to find. The search for this enigmatic celestial body started almost a century ago. For decades, an open debate remains among astronomers about the existence of Planet X, a large celestial body that supposedly orbits the outer edge of our solar system, but so far not a single celestial body that fits the descriptions of Planet X has been found, at least not until now.